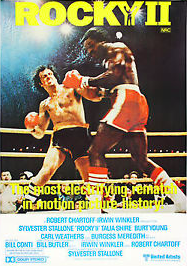 THE ROCKY FRANCHISE Rocky is a series of American boxing sports-drama films. 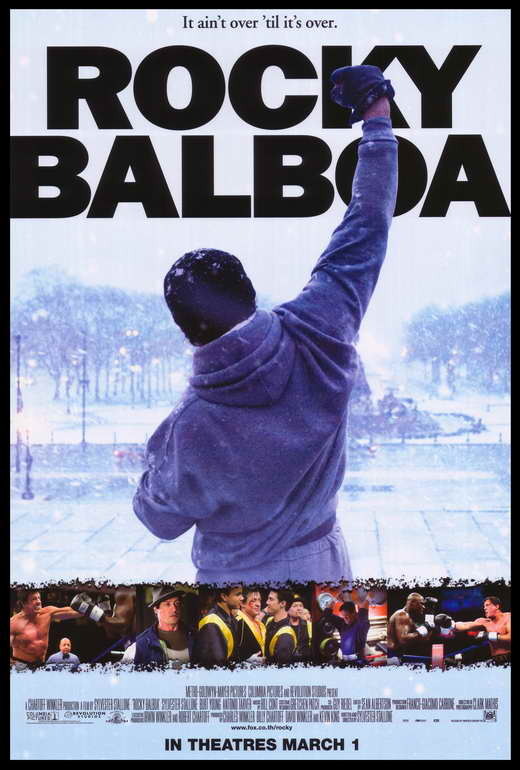 The first film, Rocky (1976), and its five sequels centered on the boxing career of the eponymous fictional character, Rocky Balboa (Sylvester Stallone). 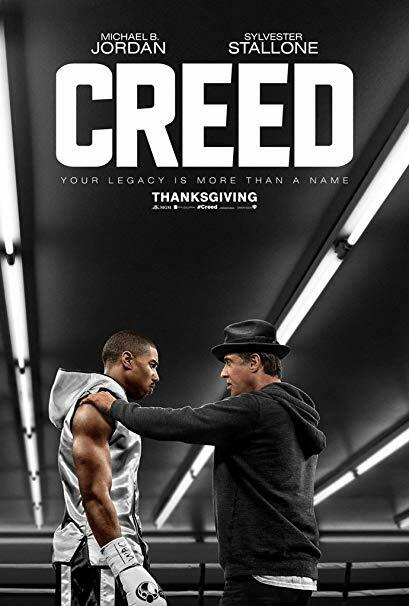 For the seventh, Creed (2015), and its upcoming sequel, the series shifted its focus towards Adonis Creed (Michael B. Jordan), the son of Rocky's deceased rival and friend Apollo Creed (Carl Weathers), trained by a now retired Rocky. 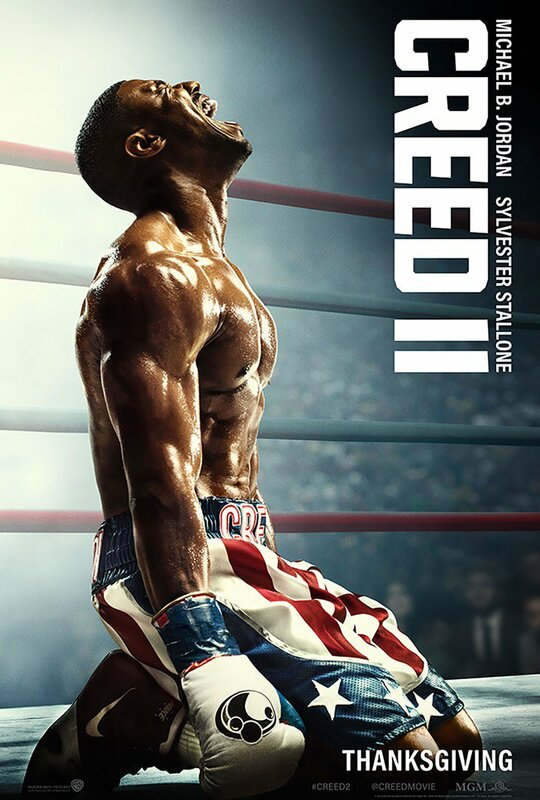 BUY TICKETS: SATURDAY, NOVEMBER 24TH @ 1:20PM We'll be watching the latest installment, Creed II, as a team at Walnut Creek Theaters. Feel free to buy tickets online (back 3 rows so we can all sit together), and parents may either join or just drop off their kid at the main door 30 minutes prior. We've linked a ton of stuff below for those who haven't watched the films to catch up. 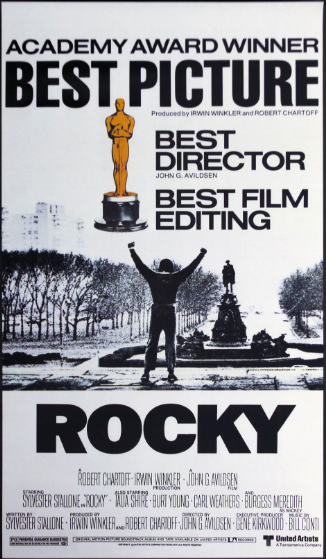 Rocky I (1976) Winning Best Picture, the first film set the franchise in motion by introducing Rocky Balboa as a rundown boxer (turned loanshark) who gets a random chance to fight the heavyweight champ Apollo Creed. 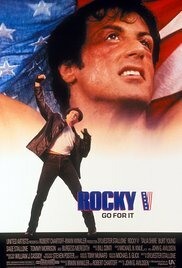 Rocky meets his wife, crazy trains by chasing chickens and punching meat, and then shocks the world by nearly knocking the champ out in a last-second loss that leaves them both hospitalized. It ends with them both telling each other they don't want a rematch. Rocky II (1979) The sequel sees a rematch between Rocky and Apollo, with Rocky trying to learn to fight correctly and balancing having a pregnant wife. His training is cut short when his pregnant wife faints and slips into a coma. She comes to on the eve of the fight, and tell him she wants him to fight. The fight has both fall in the end, but Rocky gets up at the last second to win the championship belt. 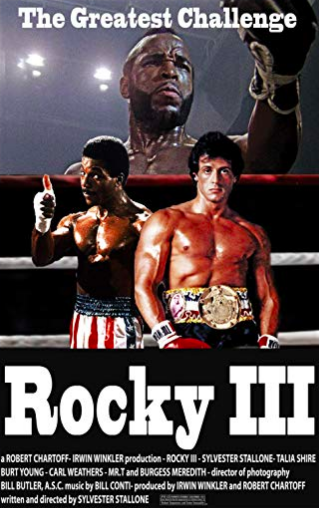 Rocky III (1982) The hit song "Eye of the Tiger" introduces the story of a now-famous Rocky about to face a street fighter named Clubber Lang (played by Mr. T). Rocky's old trainer was only giving him easy fights, then refused to train him any longer when he decided to fight Clubber because he thought he'd get killed. The trainer ends up dying, causing Rocky to lose his title. Rocky trains with Apollo Creed to learn how to box quickly (like a black boxer), and then he beats Clubber the next time. Rocky IV (1985) Rocky's rich with a mansion, robot, & sports car. A huge Russian (Ivan Drago) comes along, but Apollo Creed un-retires to shut him up. The musical montage "No Easy Way Out" sums up how the Russian kills Apollo during the fight. 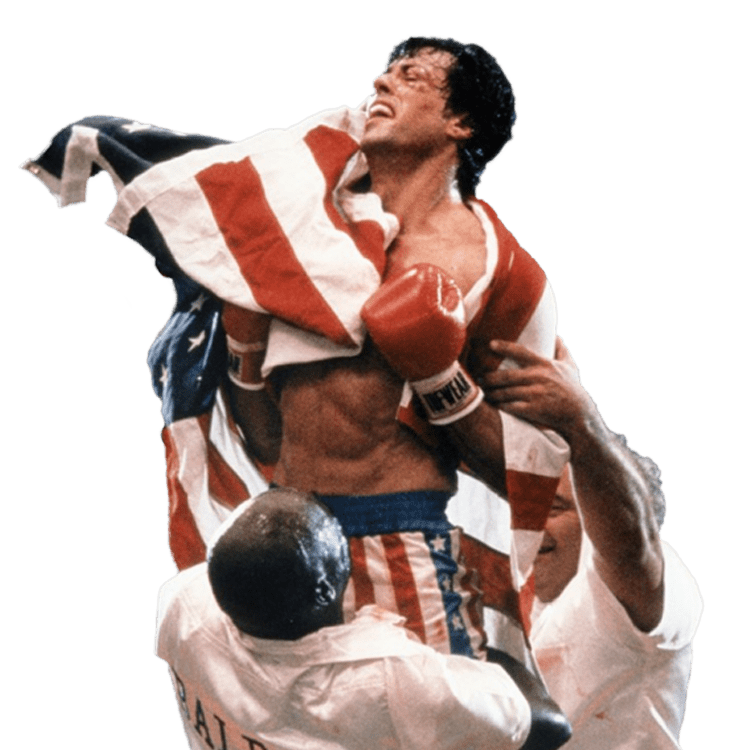 Rocky goes to Russia, his wife thinks he'll die too, he trains in the snow like a mad man, gets rocked the first few rounds, lands a gritty/lucky punch that proves the Russian isn't a machine, then beats Drago turning "the once hostile crowd" to his side. 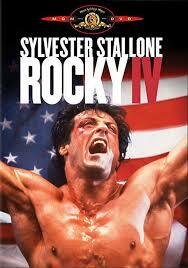 Rocky V (1990) By far the worst movie in the series, Rocky is poor and brain-damaged, and has a son who doesn't box. A white fighter with roots similar to Rocky's wants the champ's help. Rocky trains the kid, he quickly grows to be egotistical and gets a pimp manager instead, Rocky fights him in the street for some reason, beats him, and then is closer to his son in the end. Next movie! Rocky Balboa (2006) A very old Rocky Balboa is challenged to a charity boxing match by the very young champion because of an ESPN video simulation saying Rocky would've beat him in his prime. Rocky's wife is dead, he trains through arthritis, gets beat up at first, but then the champ breaks his hand on Rocky's hip. Fight lasts the entirety, with Rocky losing a close split decision. The crowd roars for Rocky, who afterwards visits his wife's grave. 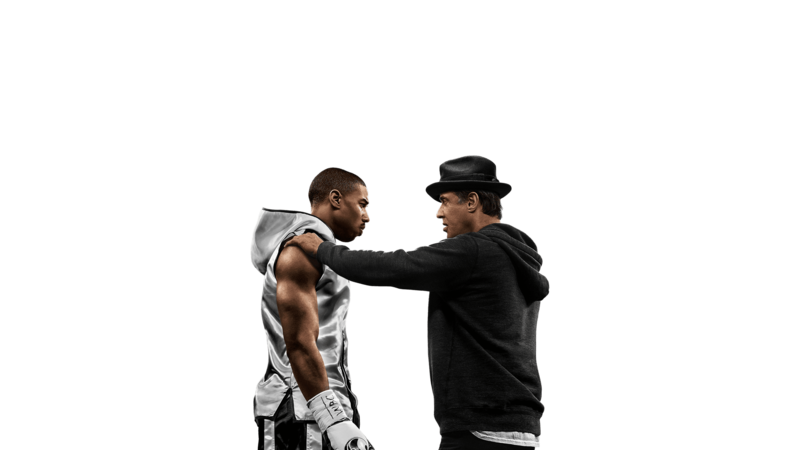 Creed I (2015) Apollo Creed's son, Adonis, becomes a fighter. He seeks out Rocky to train him, without telling him who he is. Rocky declines, but then eventually accepts. Adonis has so much rage due to his father's death, uses it to win at first until it hinders his growth. Rocky finds he has cancer and wants to die, until Adonis talks him into trying to live. Adonis fights the champ who is headed to prison, barely loses, but learns he has what it takes. Ends with them training more. Creed II (2018) The latest installment in the franchise, Creed II is set to pit Adonis against Ivan Drago's son. This time Rocky tries to talk Creed out of doing the "impossible". Will Adonis' desire for revenge against the son of the man who killed his father be his motivation or his undoing? BUY TICKETS: SATURDAY, NOVEMBER 24TH @ 1:20PM We'll be watching this movie as a team at Walnut Creek Theaters. Feel free to buy tickets online, and parents may either join or just drop off their kid at the main door 30 minutes prior.